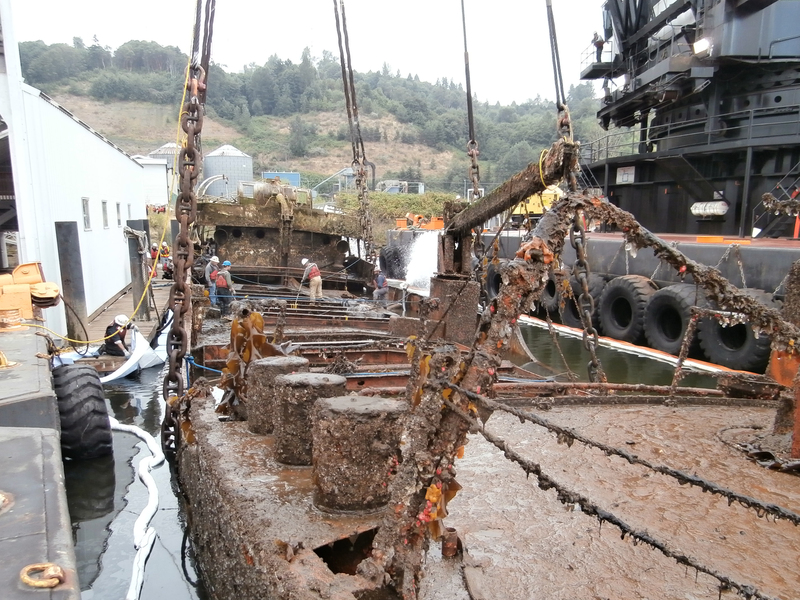 Raising Dead Ships: Derelict Vessel Removal - Global Diving & Salvage, Inc.
One of Global’s specialties is vessel salvage – if your vessel runs aground or sinks, we’ll raise it and hopefully refloat it for you. But what happens to the thousands of old, worn out vessels that sit abandoned along the coasts and harbors? Often they sink, where they pose an environmental and navigational hazard. That’s why Washington, Oregon and California have all established derelict vessel programs to assist with their prevention and removal. Over time, abandoned vessels can leach chemicals, oil and fuel and other pollutants into the water; others become navigational hazards when they sink or break free of their moorings and drift into shipping lanes. They remain unwanted, unsafe eyesores until the state requires their removal. Then salvage companies like Global bring them up – covered with mud, barnacles and marine growth like a monster from an old sea captain’s tale. Once we remove the pollutants the vessels are deconstructed for recycling and disposal. The Global crew has plenty of experience hauling out derelict vessels; over the years we’ve done hundreds of removals up and down the West Coast. A few notable projects have been the Helena Star and Murph in Washington, Challenger in Juneau, Alaska; and Spirit of Sacramento in California. Each of these vessels were in forlorn state; some were intended for other purposes that never came to fruition, while others were simply abandoned and left to rot. The derelict programs have certainly helped clean up the waterways. In Washington alone more than 600 vessels have been removed from state waterways since their program began in 2002; other states show similar numbers. One of the biggest priorities the states share is their intention to remove unwanted vessels before they become a problem with Vessel Turn-in Programs. These programs help boat owners voluntarily dispose of a vessel if they cannot afford to dispose of it themselves. Learn more about these important programs and how you can help keep our waterways from becoming vessel graveyards by clicking the links below.